Our “Fish Pin” Developmental Swim Program is consistent with the American Red Cross “Learn to Swim” instructional program. We have customized the Red Cross program in order to provide the best possible environment for each camper to advance. Campers are placed in small groups based on comfort and ability levels. Whether working on learning basic skills in shallow water or perfecting challenging deep water techniques, campers earn “fish pins” to acknowledge their progression. Click here to see all the Elmwood Swim Levels. 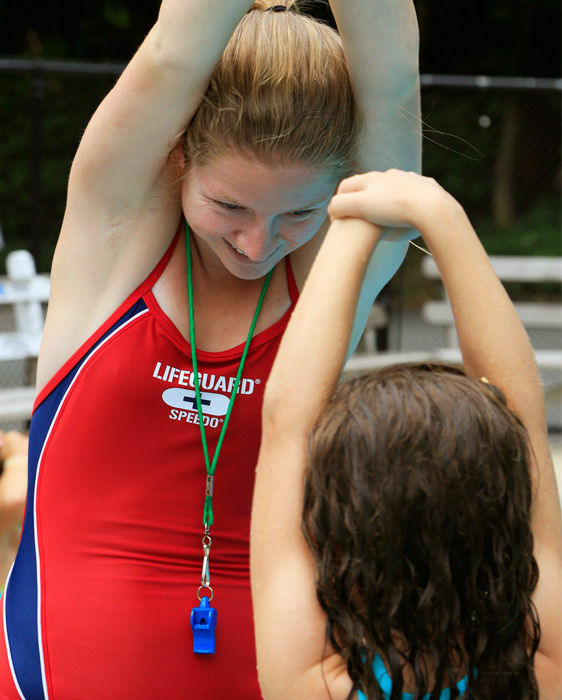 Our swim directors and pool staff are certified American Red Cross Lifeguards and Water Safety Instructors. Division heads closely monitor the swim progress of each camper in their care as well. Our pools are a safe and happy place to be! Free swim periods provide opportunities for campers to enjoy water play with their friends, practice their skills, play instructional games and participate in one of our most loved traditions….FRIDAY POOL DANCING!